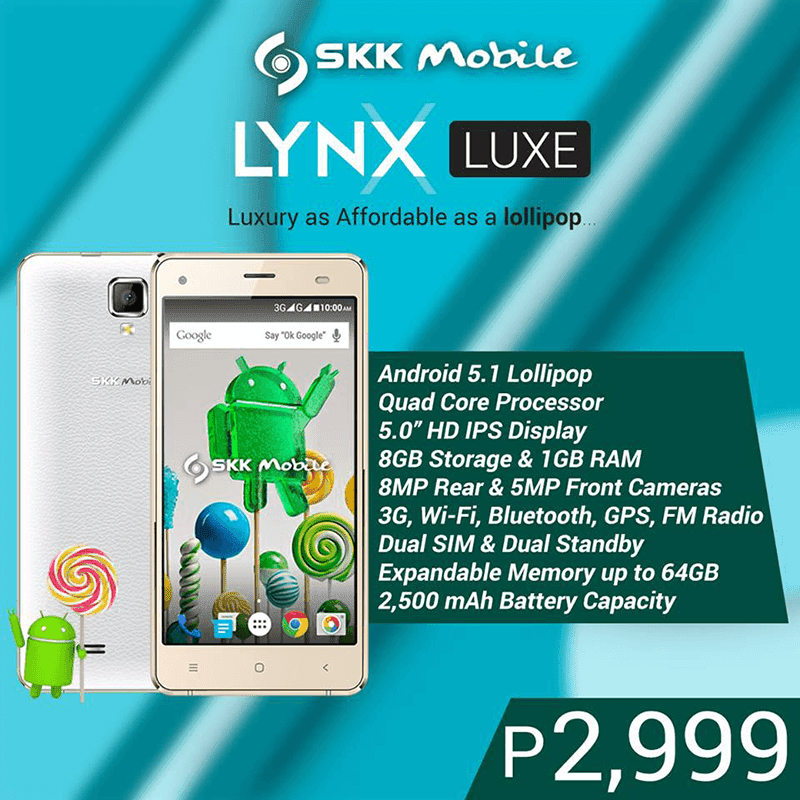 SKK Lynx Luxe Now Official, Budget Android 5.1 Lollipop Priced At 2999 Pesos! Home / mobile / news / skk / skk lynx luxe / skk lynx luxe official / skk lynx luxe price / skk lynx luxe specs / SKK Lynx Luxe Now Official, Budget Android 5.1 Lollipop Priced At 2999 Pesos! In a recent post by SKK Mobile Facebook page, they just confirmed that the leaks that circulated in the internet earlier this week was true by announcing the SKK Lynx Luxe. The SKK Lynx Luxe is their first Android 5.1 Lollipop device that features decent entry level specs and appears to have a metal glad design and faux leather textured back. It also boast a 5 inch HD screen, 1.3 GHz quad core processor, 1 GB RAM and quite large 2,500 mAh battery capacity. It also has 8 MP rear camera and 5 MP selfie shooter in front. I'll be updating this post once I have the complete details and to confirm what's the exact type of processor they used here.